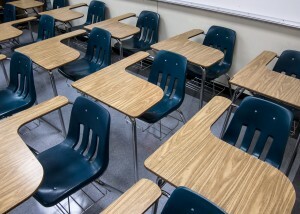 WASHINGTON — House Democratic lawmakers are clawing to get their views heard as Congress moves ahead on revising the much-maligned No Child Left Behind education law and its annual school testing requirements. They crowded into a small Capitol Hill hearing room Thursday for their own forum on changing the law in protest of Republicans’ handling of the issue. Votes on a GOP bill are anticipated soon. The bill “shows that poor, minority and disabled children are not a priority for my colleagues on the other side of the aisle,” said Rep. Marcia Fudge, D-Ohio. Some worried about a provision in the bill to let federal dollars follow a low-income student to a different public school, saying they fear it will hurt schools with a high concentration of poor students. “How do you think we can best get that message out?” said Rep. Susan Davis, D-Calif. The No Child Left Behind law, signed by President George W. Bush in 2002, was intended to close substantial achievement gaps between the academic performance of minority and low income students and their more affluent peers. It mandated that students in grades three to eight be tested annually in reading and math and be tested again once in high school. Schools that didn’t show annual growth faced consequences, and every student was to be proficient by 2014. GOP Rep. John Boehner of Ohio, now the House speaker, sponsored the legislation with the late Sen. Edward Kennedy, D-Mass., and other senior lawmakers, and Congress sent it to Bush with overwhelming bipartisan support. The law’s annual testing requirements, Common Core standards and school choice are all controversial issues wrapped up in the debate. Both sides heartily agree that the landmark law needs to be fixed, but tensions are high over the level of federal involvement in fixing schools. Complicating the matter, allegiances don’t clearly fall along party lines. While more conservative Republicans would like to essentially eliminate the federal role in education, GOP-friendly business groups side support a strong federal role, as do civil rights groups that traditionally align with Democrats. At the same time, teachers’ unions, which also tend to align with Democrats, argue the Obama administration has placed too much of emphasis on testing. Deciding that the goal of proficiency for every student by 2014 was unattainable, the Obama administration in 2012 started granting waivers to states. The waivers allow states to avoid some of the more stringent requirements of the law if they met conditions such as adopting meaningful teacher evaluation systems and college- and career-ready standards like the Common Core. The standards spell out what skills students in each grade should master in reading and math. Widespread disagreement over how to change the law has kept Congress from getting a bill to President Barack Obama. Republicans congressional leaders who now control both the House and Senate say they hope to pass a bill this year. That’s left House Democrats complaining things are moving too fast. Rep. John Kline, R-Minn., the chairman of the House Education and the Workforce Committee, released a bill to update the law similar to one passed by the House in 2013 without one Democrat on board, and scheduled a Feb. 11 committee meeting to consider it. The bill maintains testing requirements, but it strips the federal government of much of its authority — including limiting the education secretary’s role in “coercing” standards. A vote is expected in late February. Kline said the committee has had more than a dozen hearings over the last four years. “Americans have waited long enough for reforms that will fix a broken education system,” he said. Like Sen. Lamar Alexander, the chairman of the Senate Health, Education, Labor and Pensions Committee, Kline has expressed concern that a strong federal role in education stifles education advancement and innovation in states. But Rep. Bobby Scott, D-Va., the newly appointed senior Democrat on the House committee, accused House Republicans of a “hasty, partisan push” to rewrite the law and he organized the forum with a panel of education experts. Much of the discussion in the Senate has focused on whether federal testing mandates should continue. Alexander has said he’s willing to listen to both sides and he’s hopeful he can get a bill out of his committee by the end of the month. But there have been signs of dissent. The committee’s senior Democrat, Sen. Patty Murray came out this week against allowing federal money to follow students, an idea also included in a draft bill circulated by Alexander. “We have to have a bipartisan result. Otherwise we won’t have a law,” Alexander said Wednesday.